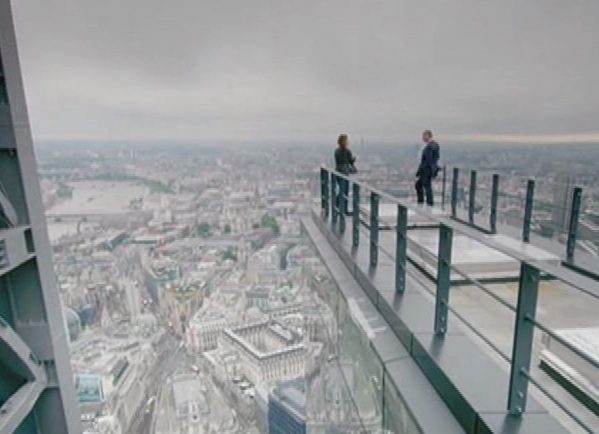 I've always wondered about balustrade heights on tall buildings. I've been on apartment balconies that have what looks like a 900mm balustrade -- 20 stories up! This might be the minimum BCA height, and it might even be a reasonable height for a balcony a couple of metres above ground; but the consequences of a fall from height is fatal; the balustrades should be designed for safety, not at a comfortable hand height, as though they are access hand rails. In retail projects I've been involved in the balustrades to internal voids were about 1200mm. Safer, but imagine an adult carrying a child, even at that height the child is entirely above the balustrade. Not good. One of the craziest low balustrades I've seen is on top of the "Cheese Grater" in London. 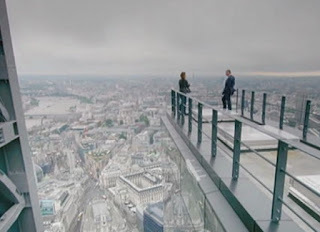 Over 200 metres above ground and the balustrade looks like its below the centre of gravity of the man on the right. A gust of wind could present a danger as could a moment of unsteadiness on the part of the man. Here the balustrade should be 1500mm.